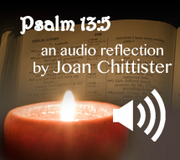 This downloadable audio file is a reflection by Sister Joan on a psalm 13 verse 5. Beautifully interwoven with instrumental music, Joan reflects on the verse�s meaning and asks probing questions about it�s message for our lives. This 9 minute meditation makes it possible for you pray this psalm on your way to work, in your prayer space, before going to sleep, waiting at the doctor�s office�anywhere, really! NOTE: This mp3 file is easily downloaded and saved to your computer or streamed live on a smartphone or tablet. Downloading and saving it to a phone or tablet is more challenging; please click and read these suggestions before buying the file if you aren't sure how to make this happen. Copyright � 2002-2013 Benetvision All Rights Reserved.